To mark the 150th anniversary of the opening of the Stockton & Darlington Railway in 1825, an exhibition of Locomotives, Rolling Stock and other relics, took place at Shildon, Co. Durham, in August, 1975. At the time of the 1925 Exhibition, the then Chairman of the L.N.E.R. was Mr. William Whitelaw. 50 years later, the distinguished visitor, was William Stephen Ian Whitelaw, his grandson. 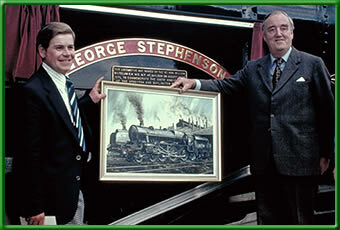 As part of the opening ceremony the name "George Stephenson" was conferred on the L.M.S. Class 5MT locomotive No. 4767. 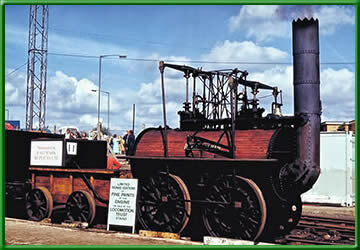 In 1975, Shildon was one of the largest railway wagon works in Europe, a long way from that small beginning in 1825. It was from here that the steam passenger locomotive was launched, surely one of the greatest events in the industrial revolution. 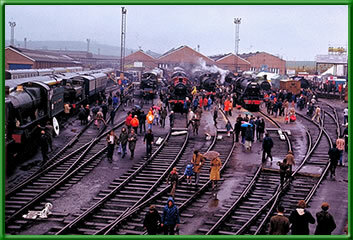 Although the industrial revolution started before the birth of the railways, it was the latter which changed England from a peasant economy to a world power inside a century. As a result of easier and cheaper transport, traffic boomed, and over the first few years of the railways existence, one of the main problems was coping with the management of this new sort of enterprise. The original "Locomotion", could not be made to work again without extensive rebuilding which would have destroyed its authenticity as an historical museum item, and therefore a full size working replica was built under the auspices of "The Locomotion Trust" by a group of engineering training establishments. It was constructed as a memorial to the pioneers of the railway and as part of the training of future engineers. 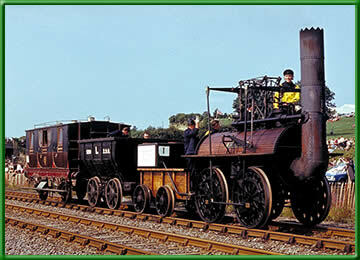 ...there may be many people who believe that this was the first railway or that 'Locomotion' was the first steam locomotive. In fact, when the first Act of Parliament for the construction of the Stockton & Darlington Railway received the Royal Assent in 1821, it was the twenty-first Railway Bill to be passed since the beginning of the century. Nevertheless in its conception, the Stockton & Darlington Railway was a far more ambitious project than any of those schemes that had preceded it." The full size replica of 'Locomotion' leading the procession, marked the end of a co-operative effort by a group of North East engineering training establishments, Companies and Individuals, organised by 'The Locomotion Trust', formed to establish and promote, the design, manufacture and operation of the locomotive, and in doing so, achieve maximum educational value from the project. The preservation and maintenance of the locomotive being a live testimony to the commercial and technical enterprise of the North East of England in the early days of the railways of the world. It is in effect a memorial to those early pioneers and was constructed as part of the training of a future generation of engineers. The replica is housed at Beamish, the North of England Open Air Museum, and on operational days carries passenger up and down the lines.